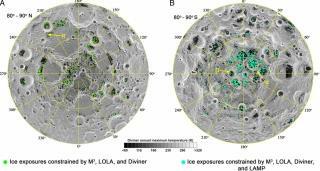 (Newser) – Future lunar colonists shouldn't have too much trouble finding water: In a first, astronomers have discovered ice—specifically patches of frost—on the moon's north and south poles, in areas permanently shaded from the sun. Found by observing how molecules absorb infrared light, the ice is particularly concentrated in surface craters or "cold traps" around the south pole, where temperatures are a chilly -250 degrees Fahrenheit, Live Science reports via a PNAS study. It notes this is the first "direct and definitive evidence" of ice exposed on the moon's surface. Though water molecules were previously found, the ice deposits "might be utilized as an in-situ resource in future exploration of the moon," the study authors write, per the Guardian. Chee. Wouldn't you wanna spend a coupla years up d'ere explorin' it? This comment section is proof that intelligent life does not exist anywhere in the universe.